1. Lynn Paul Mattson & Peter Van Dyke Not for Publication Rules Versus Stare Decisis . . . If it's Not Picked for Publication it Doesn't Exist - But Who Does the Picking? Social Science Research Network (2006). 6. Peter W. Martin Neutral Citation, Court Web Sites, and Access to Authoritative Case Law; Cornell Legal Studies Research Paper No. 06-047, December 2006. 7. Diane Adams-Strickland Don’t Quote Me: The Law of Judicial Communications in Federal Appellate Practice and the Constitutionality of Proposed Rule 32.1; CommLaw Conspectus: Journal of Communications Law and Policy; Fall 2005. 25. Jessie Allen Just Words? The Effects of No-Citation Rules in Federal Court of Appeals; 29 Vt. L. Rev. 555 (2005). 27. Stephen R. Barnett In Support of Proposed Federal Rule of Appellate Procedure 32.1: A Reply to Judge Alex Kozinski; Federal Lawyer, Nov./Dec. 2004 at 32. 28. Alex Kozinski In Opposition to Proposed Federal Rule of Appellate Procedure 32.1; Federal Lawyer, June 2004 at 36. 29. Martha Dragich Pearson Citation of Unpublished Opinions as Precedent; 55 Hastings L. J. 1235 (2004). 30. Penelope Pether Inequitable Injunctions: The Scandal of Private Judging in the U.S. Courts; 56 Stan. L. Rev. 1435 (2004) (See also Private Justice Can Be Yours if You're Rich Michael Hiltzik; Los Angeles Times; March 16, 2006, and Growing Use of Private Judges Raises Questions of Fairness Ted Rohrlich, L.A. Times, December 26, 2000). 38. William R. Mills The Shape Of The Universe: The Impact Of Unpublished Decisions On The Process Of Legal Research New York Law School Law Review 46: 429. 39. Joshua R. Mandell Trees That Fall In The Forest: The Precedential Effect Of Unpublished Opinions Loyola of Los Angeles Law Review 34: 1255. 40. David Stephen Law The Paradox of Omnipotence: Courts, Constitutions and Commitments (Abstract). 41. David Stephen Law Strategic Judicial Lawmaking: Ideology, Publication, and Asylum Law in the Ninth Circuit 73 University of Cincinnati Law Review 87 (May 2005). 42. Supreme Court of Wisconsin, In the Matter of the AMENDMENT OF WIS. STAT. § (RULE) 809.23(3) regarding citation to unpublished opinions. 2003 WI 84. 44. Barnett, Stephen R., STATEMENT AT THE HEARING ON PROPOSED AMENDMENTS TO THE FEDERAL RULES OF APPELLATE PROCEDURE BEFORE THE APPELLATE RULES COMMITTEE, UNITED STATES JUDICIAL CONFERENCE; April 13, 2004. 45. American College of Trial Lawyers, OPINIONS HIDDEN, CITATIONS FORBIDDEN: A REPORT AND RECOMMENDATIONS OF THE AMERICAN COLLEGE OF TRIAL LAWYERS ON THE PUBLICATION AND CITATION OF NONBINDING FEDERAL CIRCUIT COURT OPINIONS; March 2002. 46. David R. Dow; Bridget T. McNeese, INVISIBLE EXECUTIONS: A PRELIMINARY ANALYSIS OF PUBLICATION RATES IN DEATH PENALTY CASES IN SELECTED JURISDICTIONS; Texas Journal on Civil Liberties & Civil Rights; 2004. 48. Cappalli, Richard B., The Common Law's Case Against Non-Precedential Opinions; Southern California Law Reivew, May 2003. 51. Tusk, Marla Brooke, No-Citation Rules As A Prior Restraint On Attorney Speech, 103 Colum. L. Rev. 1202 (2003). 53. Laretto, Kenneth Anthony, Stanford Law Review; "Precedent, Judicial Power, and the Constitutionality of No-Citation Rules in the Federal Courts of Appeals"
54. 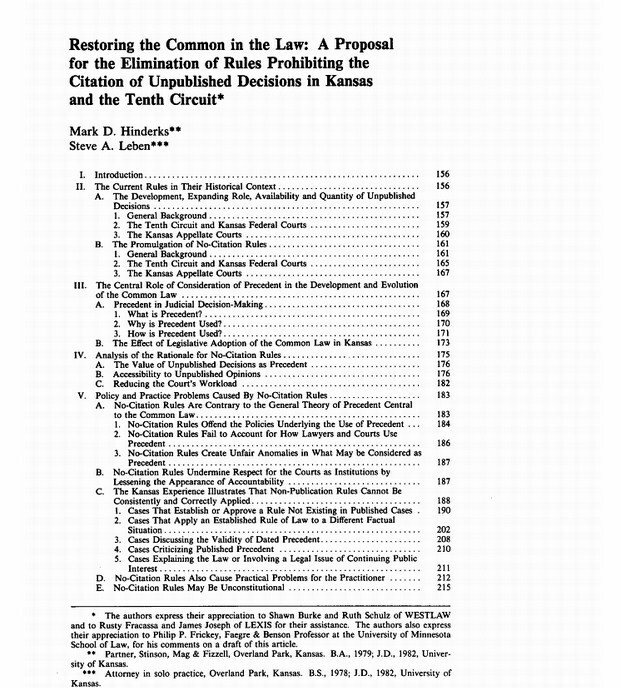 Barnett, Stephen R., The Journal of Appellate Practice and Process; "FROM ANASTASOFF TO HART TO WEST’S FEDERAL APPENDIX: THE GROUND SHIFTS UNDER NO-CITATION RULES" Vol. 4, No. 1 (Spring 2002). 57. Melissa M. Serfass & Jessie L. Cranford Federal and State Court Rules Governing Publication and Citation of Opinions, 3 J. App. Prac. & Process 251 (2001). 61. Eighth Circuit Holds That Unpublished Opinions Must Be Accorded Precedential Effect (2001) 114 Harv.L.Rev. 940. 64. Ward, Raymond P. "Williams v. Dallas Area Rapid Transit: Rule denying precedential status to unpublished decisions changes the outcome of the case"
65. Bashman, Howard J. "The Unconstitutionality of Non-Precedential Appellate Rulings"
66. Van Der Velde, Robert J. "Statement of Professor Rober J. Van Der Velde to the Commission On Structural Alternative for The Federal Courts Of Appeals"
67. Reynolds, William L and. Richman, William M "Elitism, Expediency, and The New Certiorari: Requiem For :The Learned Hand Tradition" 81 Cornell Law Review 273 (1996) This article is recommended as an overview of nonpublication. 109. Quitschau, Drew R. "ANASTASOFF V. UNITED STATES: UNCERTAINTY IN THE EIGHTH CIRCUIT-IS THERE A CONSTITUTIONAL RIGHT TO CITE UNPUBLISHED OPINIONS?" 54 Arkansas Law Review 847 (2002). 110. Erica S. Weisgerber, Unpublished Opinions: A Convenient Means to an Unconstitutional End, Georgetown Law Journal, January 2009. 111. Carl Tobias, Anastasoff, Unpoublished Opinions, and Federal Appellate Justice, Harvard Journal of Law and Public Policy, Summer 2002. 112. Suzanne O. Snowden, "That's My Holding and I'm Not Sticking To It!" Court Rules That Deprive Unpublished Opinions of Precedential Authority Distort the Common Law, Washington University Law Quarterly, Winter 2001. 113. Jerome I. Braun, Eighth Circuit Decision Intensifies Debate Over Publication and Citation of Appellate Opinions, Judicature, September/October 2000. 114. Frederick Schauer, Precedent, Stanford Law Review, February 1987. Please also see “Teacher’s Manual” material for the above-cited casebook, which references www.nonpublication.com. Finally, please also see the Harris and Lebrilla decisions referenced in Note 4 of the above discussion of Schmier v. Supereme Court. 148. David R. Cleveland Clear as Mud: How the Uncertain Precedential Status of Unpublished Opinions Muddles Qualified Immunity Determinations, 65 U. Miami L. Rev. 45 (2010). 149. David R. Cleveland Local Rules in the Wake of Federal Rule of Appellate Procedure 32.1, Journal of Appellate Practice and Process, 2010. 150. David R. Cleveland and William D. Bader Precedent and Justice, 49 Duq. L. Rev. 35 (2011). 151. Robert C. Berring Legal Research and Legal Concepts: Where Form Molds Substance, 75 Cal. L. Rev. 15 (1987). 152. William L. Reynolds and William M. Richman Limited Publication in the Fourth and Sixth Districts, 1979 Duke L. J. 807 (1979). 153. Thomas Healy Stare Decisis as a Constitutional Requirement, 104 W. Va. L. Rev. 43 (2001). 154. Penelope Pether Socerers, Not Apprentices: How Judicial Clerks and Staff Attorneys Impoverish U.S. Law, 39 Ariz. St. L.J. 1 (2007). 155. Michael Gentithes Precedent, Humility and Justice, Texas Weleyan Law Review, Forthcoming. 157. Jason B. Binimow Precedential Effect of Unpublished Opinions 105 A.L.R.5th 499 (2003).